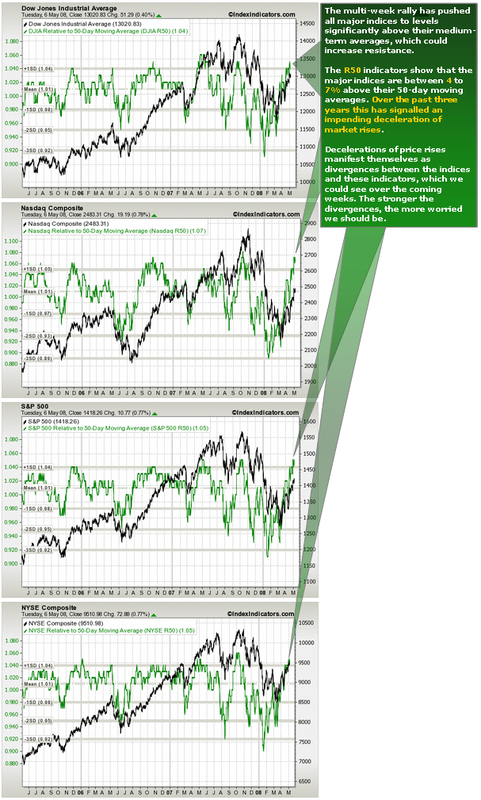 Over a month ago, we witnessed and abnormal expansion in market breadth, which helped predict the multi-week rally we’ve seen so far. The major indices are now between 4 to 7% above their 50-day moving averages, something that doesn’t happen very often. The R50 indicators for the Dow, Nasdaq, SPX and NYSE are all 1-standard deviation above their 3-year means. Recent history suggests that this is a sign of an impending decrease in the rate of price rises, or a deceleration of the rally. Decelerations manifest themselves as divergences between the indices and these indicators, which we could see over the coming weeks. The stronger the divergences, the more worried we should get. I really enjoy the site and your objective view of things. Absolutely wonderful work.